Sun., 1 Sep. - Sun., 8 Sep.
Fri., 20 Sep. - Wed., 2 Oct. Thu., 31 Oct. - Tue., 5 Nov. Thu., 17 Oct. - Sun., 27 Oct. Sun., 12 May - Thu., 13 Jun. Mon., 7 Oct. - Sun., 13 Oct.
Fri., 20 Sep. - Sat., 21 Sep.
See all 1,182 properties in Austin-Bergstrom Intl. 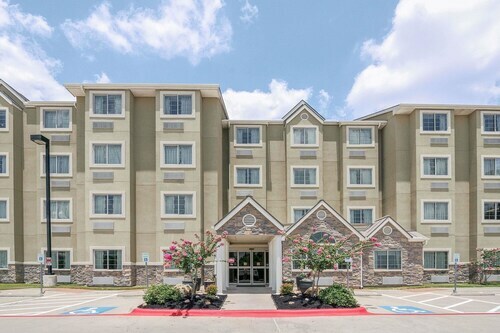 Situated near the airport, this hotel is 1.9 mi (3.1 km) from Riverside Golf Course and 3 mi (4.8 km) from Lady Bird Lake. South Congress Avenue and Roy Kizer Golf Course are also within 6 mi (10 km). 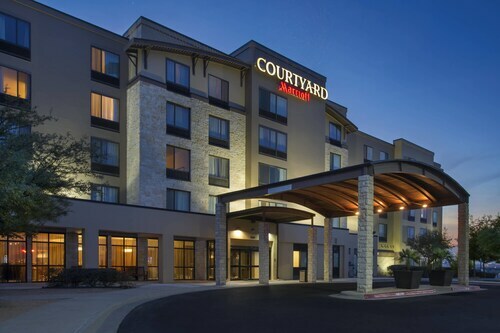 Situated near the airport, this hotel is within 9 mi (15 km) of Governor's Mansion, LBJ Presidential Library, and University of Texas at Austin. Texas State Capitol and Bob Bullock Texas State History Museum are also within 12 mi (20 km). A free airport shuttle whisks guests from the terminal to Best Western Plus Austin Airport Inn & Suites, or vice versa, in 10 minutes. The Texas State Capitol and other downtown attractions are a 15-minute drive away, and the Colorado River runs nearby - great for hiking along its well-kept trails. Located in Montopolis, this hotel is 2 mi (3.2 km) from Riverside Golf Course and 3.1 mi (4.9 km) from Lady Bird Lake. McKinney Falls State Park and Austin Convention Center are also within 9 mi (15 km). Question : How much is a plane ticket to Austin (AUS) from Vancouver (YVR)? Answer : Prices can range from $331 to $1,437. Booking far in advance can typically help you get the cheapest rate. However, usually the sooner you book, the better price you get. Question : How long do most people stay in Austin on average? Answer : The cheapest day to fly from Vancouver to Austin is on Sunday. If you want to save a bit of cash on your next trip look for flights on that day. Answer : You sure can adjust your departure or arrival date and you may save yourself some money by doing it. The lowest-cost day to fly in April is Sunday. You might think you're missing out taking off a day early, but we think that you are just adding those savings towards your next getaway. Question : What is the cheapest airline flying from Vancouver to Austin? Answer : United Airlines is your best flying friend for finding that coveted low fare. They're offering fares as low as $331, while rates for other flights can cost as much as $1,437. Question : What airports do you fly into for Austin? Answer : Departing from Vancouver International Airport isn't the only way to get to Austin-Bergstrom International Airport. Try looking for flights from Victoria International Airport (YYJ). Over the upcoming two months, flights from YYJ to AUS are being booked 17% cheaper than flights from YVR to AUS. Being 40 miles away from YVR.